Elves are among the most ancient civilizations on Azeroth and share a common origin with each other in Kalimdor. Differences in both their physical and cultural traits have manifested over time, which we will discuss in this manual. Scholarly types have determined that all Elves are the descendants of a tribe of Dark Trolls who settled along the banks of the Well of Eternity in ages past, before The Sundering and the War of the Ancients. Over time, these trolls were physically and intellectually transformed by the powers of the Well, subjugating much of their savage instincts in lieu of spiritualism and intellect - though in some cases some of this savagery would see a resurgence as a result to cultural differences rather than being a strictly instinctual in nature. Magical forces have continued to greatly influence the evolution of the descendants of these first Elves into the various types we see today. The Night Elves are the direct descendants of the first Dark Trolls who were transformed and evolved due to their proximity to the Well of Eternity. They are a deeply spiritual people, many of them worshiping their moon-goddess called Elune, to whom they build temples and wells with magical healing waters. They hold a fanatical worship of the forest and primeval spirit animals, though they do not devolve into the savage practice of blood sacrifice performed by their Troll cousins. Consisting of arcanists and spellcasters, the Highborne were the highest caste in Night Elf society and served as the leaders of their civilization prior to the destruction of the Well of Eternity. Highly skilled spellcasters, the Highborne abuse of magic eventually drew the Burning Legion to Azeroth and triggered the War of the Ancients. 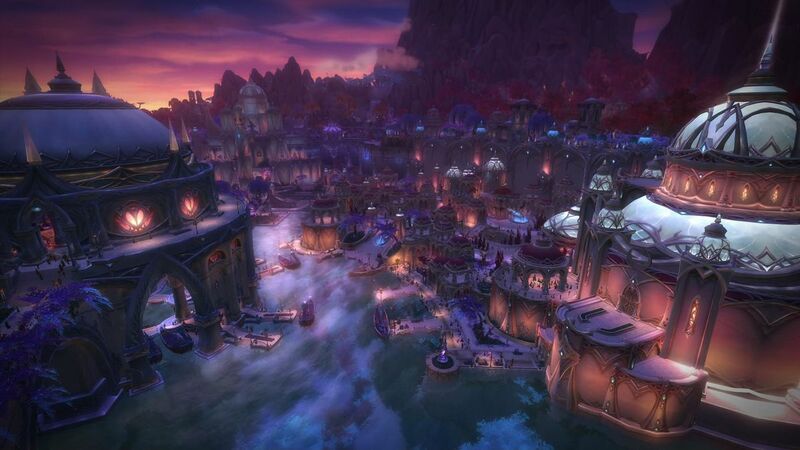 After the Legion's defeat, some of the Highborne were exiled from Kalimdor and sailed east, where they would settle in modern-day Quel'thalas and build the city of Silvermoon as High Elves. Those closest to Queen Azshara were also exiled, and have been transformed into the Naga. Consisting almost exclusively of female warriors, huntresses and scouts. Highly skilled in hit-and-run, ambush and unconventional warfare, they have been able to almost single-handedly halt the Horde advance into their lands due to their superior knowledge of the terrain. Consisting almost exclusively of female warriors specializing in hunting down, capturing or assassinating particularly dangerous targets. The Wardens are highly capable scouts and strike with deadly precision. Perhaps the closest connection to their troll cousins due to the ritualistic practice of animal worship, the Druids consist almost exclusively of males who can shape-shift into various animal forms. They take on the role of spiritual leaders alongside with their priestesses and tend to live in underground burrows where they can sleep for years in a state of deep hibernation. The spiritual leaders of Night Elf society, the Priests and Priestesses of the Moon empower the various moon wells and temples with magical healing waters through the light of the moon. 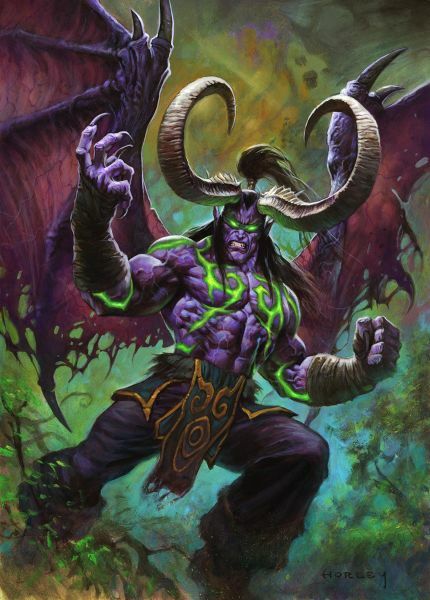 Also known as the Illidari after their master Illidan Stormrage, Demon Hunters are not really part of the traditional Night Elf caste system, as they a sub-culture within Night Elf society who have been exiled for their use of Fel magic. Many of the Night Elves who saw their families murdered by the Burning Legion became overtaken with an unquenchable thirst for vengence, and vowed to do whatever it takes to defeat the Burning Legion and vanquish Demons from this world. They are particularly dangerous, even as allies, as their ferocity and steele resolve in battle is absolute, unwavering and without fear. Very tall, athletic and agile, with either silver-colored or gold-colored eyes. They feature prominently long, floppy ears as a result of their troll ancestry. Though they do not have tusks like their troll cousins, many Night Elves do have sharp canine teeth. Skin tones vary, but they vary somewhere between dark to pale purple skin tones, with some hints of blue. Hair colors and types vary, but many Night Elves have purple, blue, green or white hair, either bound in braids or draped wildly. Night Elves have particularly strong upper body strength, due to their instinctual inclination to climb trees and swing around on tree branches to evade detection and forage for food. Demon Hunters will also feature demonic features, such as leathery wings, clawed hands, horns and demon-like legs, often wearing a bandanna over their eyes as they rely on magical sight after gouging out their own eyes in ritualistic self-mutilation. Night Elves have traditionally been a deeply reclusive, spiritual people, highly suspicious and dangerously aggressive towards outsiders who enter their lands. Not known for their hospitality, Night Elves have often been described as aloof to the plight of outsiders, though deeply protective of their own interests and lands. A recent exception to this was the aid they extended to the people of Gilneas who had been afflicted with the Worgen Curse, and their growing involvement in lending forces to the Alliance. Is it best to be deeply observant and critical of the motives of Night Elves. It is also suspected that they are responsible for the disappearance of Lieutenant Alverold and his scouting force as they explored the coast around Kalimdor and were set to rendezvous with Lieutenant Benedict in Tiragarde Keep in Durotar. Despite their longevity and the wisdom that should come with thousands of years of accrued knowledge, Night Elves can be prone to fits of childish rage, jealousy and anger that can be exploited by intelligent enemies for the purpose of forcing costly errors on their part. When sufficiently provoked, a Night Elf may put their brothers and sisters in arms in grave danger while they pursue whatever personal vendetta is fueling their rage - all at the expense of both strategic and tactical advantage. Be careful in putting your safety and the success of the mission solely on the shoulders of a Night Elf. By and large they are without the martial discpline and steele resolve to see the mission done as would be expected of a Kul Tiras Marine. They can still be helpful in a pinch as they are highly skilled combatants and their interests will often align with ours - especially when there are greenskins and spear chuckers to kill. If the battle is on Night Elf territory or protecting some kind of magical tree, holy shrubbery or sacred rock, you can be certain that they will not falter in their resolve. aka Sin'Dorei (Blood Elves), Quel'Dorei (High Elves), Ren'Dorei (Void Elves), Pointy-Eared Princesses, Pretty Little Faeries. 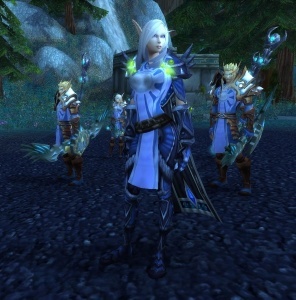 Thalassian Elves refers to all the different groups of elves who hold a common heritage with the ancient High Elf civilization which was established in Quel'thalas after the Night Elf Highborne were exiled from Kalimdor because they would not give up their studies of the Arcane. These different groups of elves were once part of the same Kingdom of Quel'thalas until The Scourge ravaged their lands during the Third War, destroying their capital of Silvermoon and corrupting the Sunwell from which the elves drew their power. Prior to the Third War, the Thalassian Elves had maintained a friendship with the human Empire of Arathor, when the humans helped the elves who were on the verge of defeat against the Forest Trolls of the Amani Empire. In exchange for their aid, the Thalassian Elves taught 100 humans the secrets of magic, and over time the ranks of human arcanists expanded greatly, culminating in the construction of the Violet Citadel and the City of Dalaran where Humans and Thalassian Elves have lived and studied the Arcane Arts together for thousands of years. By far the largest of the Thalassian Elf groups, the Sin'dorei (Blood Elves in the Common tongue) are the vast majority of the survivors of the Scourging of Quel'thalas. Prior to the Third War, these Blood Elves were known as High Elves, and changed their name to Blood Elves in honor of the dead who had been killed by the Scourge. The Sin'dorei are led by Lor'themar Theron from their capital of Silvermoon. Prior to the ascension of Lor'themar Theron, they were led by Prince Kael'thas Sunstrider, who under the tutelage of Illidan Stormrage learned how to tap into the powers of the Fel to sate the elves' addiction to magic. The Sunwell was eventually purified of the Fel with the help of the Draenei, Prophet Velen and the naru M'uru. This purified Sunwell now provides a source of Holy magic to the Sin'dorei. Blood Elf consumes the mana from living beings to sustain their mana addiction. 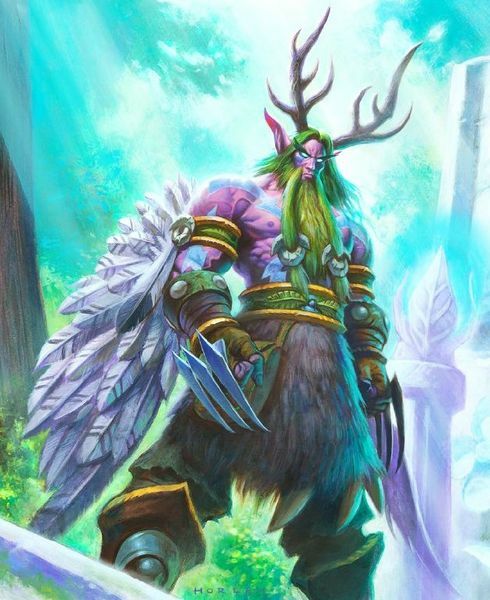 While the Thalassian Elves in Silvermoon and Quel'thalas were largely wiped out by the Scourge, there was a sizeable number living in the Human Kingdoms and also some in Quel'thalas who disagreed with Kael'thas Sunstrider's call to utilize the powers of the Fel to sate their magical addiction. These elves, still calling themselves High Elves, believed that there were other ways to maintain their connection to the Arcane without tainting themselves with the Fel. For their insubordination, they were exiled from Quel'thalas. Having always lived around Humans, the Quel'dorei now live in the various human kingdoms as guests, angered that they were exiled from their homes simply for honoring their values and traditions over blood and race. The Quel'dorei are most commonly found in the City of Dalaran where they form a sizeable militray force in the Silver Covenant, and also in the Mage District of Stormwind where many of them have found a new home until the day they can return to Quel'thalas in peace. A sect of Blood Elves who were exiled from Quel'thalas for studying the powers of the Void, the Ren'dorei (or Void Elves in the Common tongue) are masters of Void energies and study under the tutelage of Lady Alleria Windrunner to harness the powers of the Void while resisting the maddening whispers of the Void Lords and their minions. They have chosen to use the enemy's power against them, much like the Demon Hunters used the powers of the Fel to combat the Burning Legion. Thalassian Elves of all types are slender, athetic with fine facial features and long, pointy ears, though not as long or floppy as seen on Night Elves or Nightborne. Female Thalassian Elves are famous for being exceptionally beautiful, while the males are typically regarded as comically effeminate and can easily be confused with a female human or elf - a characteristic which has historically led to many Thalassian females to prefer more masculine human men as mates and the resulting propagation of half-elves, especially in areas where Thalassian Elves and Humans have historically lived together such as Dalaran, Lordaeron and Stormwind. Thalassian Elves eye color is typically an indication of the source from which they draw their magic. Blood Elves typically have fair skin and fine Blonde hair or Red Hair, but some have black hair. 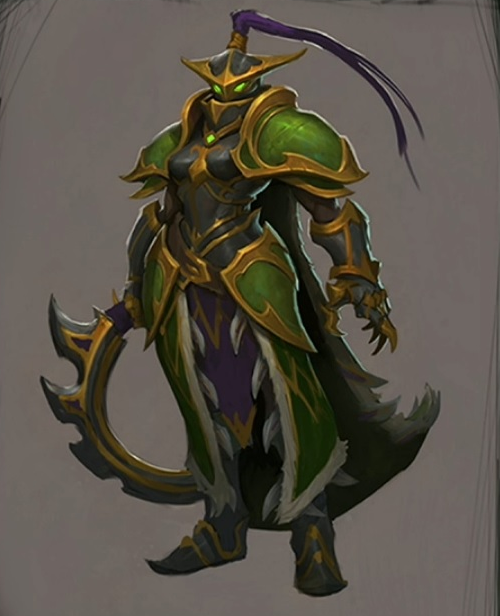 Most Blood Elves exhibit bright green as a result of their consumption of Fel energy after the destruction of the Sunwell, though since the most recent cleansing of the Sunwell and their newfound empowerment by the Holy Light. lighter-skinned and have light blonde hair or blue hair. Some High Elves have spent much of their time in the wilds as part of the ranger contingent tend to also adorn their bodies with tribal tattoos and war paints. Void Elves typically have deathly pale skin and darker hair with tendril-like blue and purple void-empowered glow. 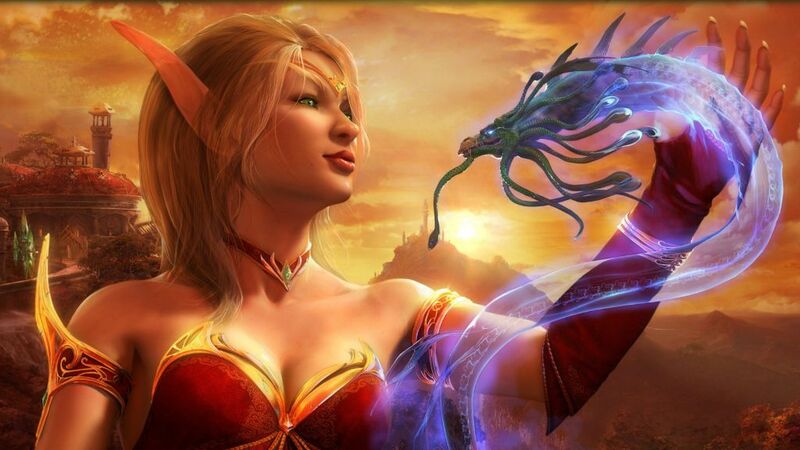 Thalassian Elves are a highly intelligent, analytical people with a close connection to magical energies. Prior to the Scouring of Quel'thalas, they were often regarded as a somewhat cloistered, secretive people, but with a benevolent culture that maintained an affinity and respect for life and the natural world. Since that time, the Blood Elves tend to be more war-like and defensive in stature as a response to how close they came to becoming extinct. Their high intelligence also makes them capable of complex and effective deceptions that would rival the guile of a Nathrezim. By contrast, High Elves have largely maintained a more amicable and calm culture, except for when the Blood Elves are concerned as the High Elves tend to regard the Blood Elves as traitors to their people's traditions and values, having sided with the monstrous Horde. The Void Elves are the most secretive of the three, devoting much of their time to the study of the Void though doing so with little moral reservation and with a steele determination to master and dominate the dark forces for the good of all. Thalassian Elves' greatest weakness is their reliance on sources of magical energy to sustain themselves. Without a source of magic, Thalassian Elves will begin to devolve into emaciated husks driven only by the overwhelming consumption of mana to sate their uncontrolled addiction and desperation. Mana deprivation has been shown to be an effective, if very slow, means of extracting information from Blood Elves, though doing so requires coordination by powerful Arcanists who are able to counter attempts to siphon mana directly from the life essence of their interrogators. Despite the betrayal by a large proportion of the Thalassian population against their historical allies, Thalassian Elves continue to be an important part of both the Horde and the Alliance. Their sharp intellect and affinity for all things magical make them powerful enemies and allies depending on what side they happen to be on. It is one of the objectives of the Kul Tiras Marines to reach out to those within the lower strata of Thalassian society and bring them back into the fold, in order to re-establish the unity in the Eastern Kingdoms which at one point brought peace and prosperity to all our peoples. A sect of Night Elves from the ancient City of Suramar. After the War of the Ancients and the Sundering, the Nightborne shrouded themselves from the outside world under a magical arcane dome which protected their city during the Sundering. When the Legion returned recently, their Grand Magistrix Elisande unilaterally surrendered to the Legion in fear that failing to capitulate would lead to the destruction of her people. 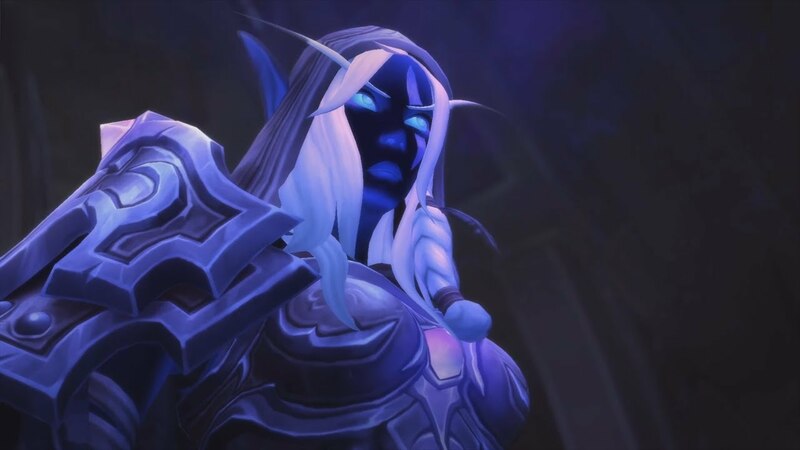 A sect of Nightborne, led by First Arcanist Thalyssra, rebelled against the Grand Magistrix, and with the aid of the Night Elves, Blood Elves and High Elves, were able to repel the Legion from their city. 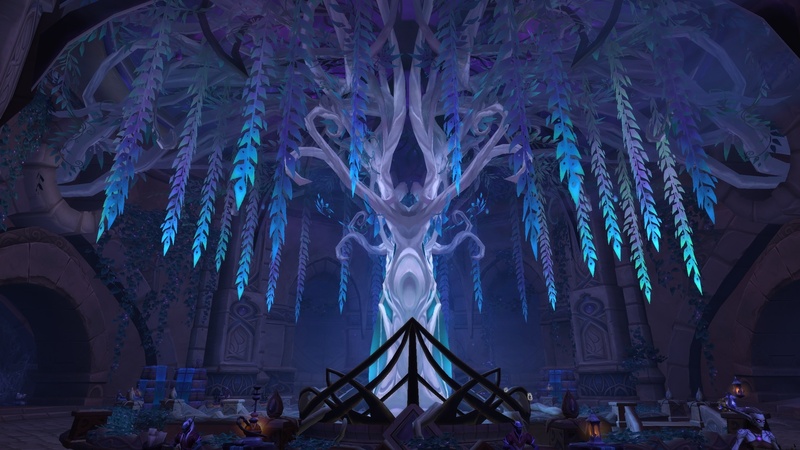 The Night Elves also taught the Nightborne how to grow a magical tree called the Arcandor, which cured the Nightborne of the magical addiction which was turning them into lifeless husks. 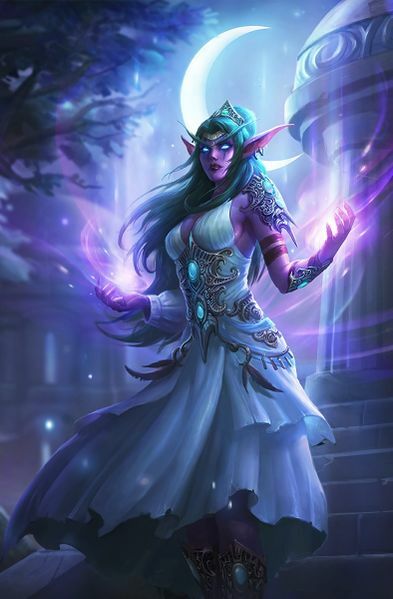 Despite the aid provided by the Night Elves and High Elves, First Arcanist Thalyssra chose to join forces with the Horde, betraying many of the people who came to her defense - and trading the tyranny of the Grand Magistrix for that of the Banshee Queen. A Night Elf Valewalker taught the Shal'Dorei the secrets of the Arcandor, a mystical tree which fuses Arcane and Nature magic to produce a fruit that frees the Shal'Dorei of their magical addiction. 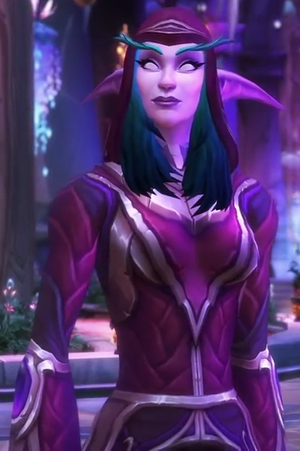 Almost indistinguishable from Night Elves, the Shal'Dorei have dark blue or purple skin with long floppy ears. 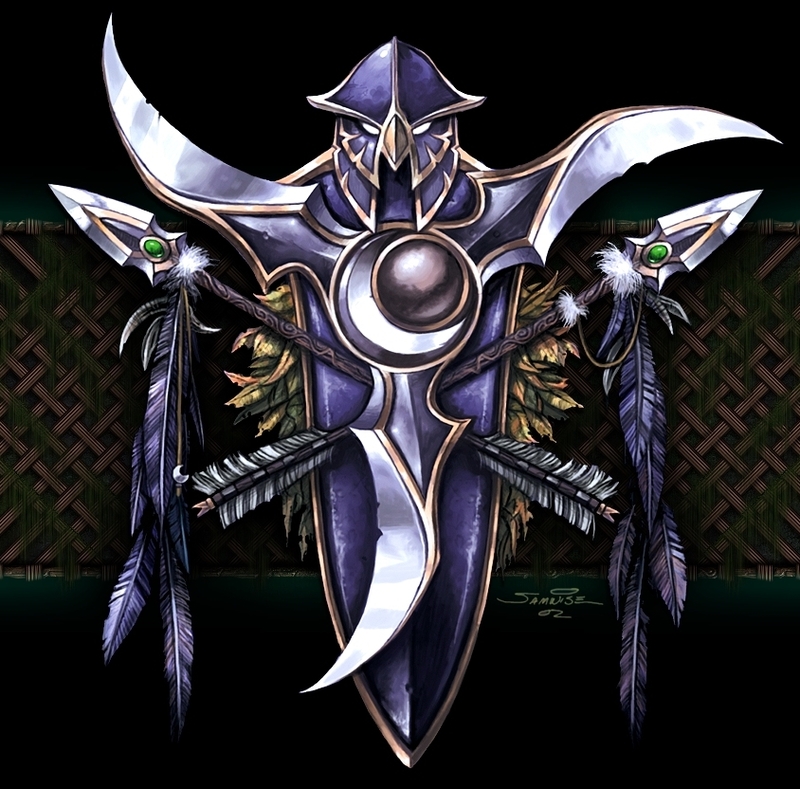 Unlike the Night Elves, they also wear ornate arcane markings and tatoos on their bodies and are usually not as physically imposing or strong as the Night Elves, due in large to their over-reliance on Arcane energy to sustain themselves for the last ten thousand years - while the Night Elves developed a culture of rugged wilderness survival. Some are quite gaunt and emaciated, and those who have not been cured of their addiction by the fruit of the Arcandor will devolve into mindless Withered. The Nightborn an exceedingly intelligent people with terrible judgement, poor self-control, and a masterful command of the Arcane. They are a profoundly arrogant, looking down on their Night Elf and High Elf cousins as "low born" - a reflection of the archaic and backward caste system which was once also part of Night Elf society. While there are a few among Nightborn society with a strong sense of conviction and independent thought, they won't act against injustice without first suffering overwhelming losses due to widespread apathy, cowardice and fragility in their society. Having sustained themselves through magical means for ten thousand years via the Nightwell, thousands of Nightborn died due to acute magical addiction and withdrawal. Their insufferable arrogance also makes Nightborn lull themselves into a sense of invincibility, whereby they can easily make critical tactical and strategic miscalculations that enemies can exploit to great effect. A Nightborn may be able to relapse into acute magical addiction if withdrawn from normal sources of sustenance and put back into a regime of Arcane-based sustainment - allowing for greater control over a captive Nightborne if needed. Nightborn devolve into withered if cut off from a source of Arcane energy. The Nightborn made a grave mistake in aligning themselves with the Horde after the defeat of the Burning Legion. They must be shown the error of their ways, just like the Sin'Dorei, and rejoin the civilized nations of Azeroth against the savagery of the Horde.